Operation Rescue complaint ignored while Alexander remains free to break the law. Forestville, MD – An abortionist who is currently barred from conducting surgical abortions at an unlicensed facility has been caught red-handed conducting late-term Dilation and Evacuation abortions late at night in an apparent attempt to avoid detection. 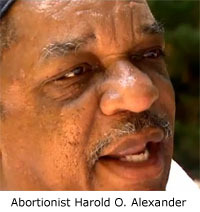 Harold O. Alexander has for years operated a nefarious unlicensed abortion business called Integrated OB/GYN Services, located on the third floor of an office building at 7610 Pennsylvania Avenue in Forestville, Maryland. After his abortion facility failed a licensing inspection in 2013, the Maryland Board of Physicians issued a cease and desist order to Alexander directing him to stop performing surgical abortions and stop administrating certain drugs there. A pro-life activist in Maryland filmed activity at Alexander’s office on evening of Friday, February 26, 2016, at approximately 9:45 p.m. The parking lot, which was usually empty at that late hour, contained several parked cars. That video was released to Operation Rescue. Suspecting that Alexander may have been conducting surgical abortions surreptitiously to avoid discovery, an Operation Rescue staffer placed a phone call to Alexander’s business number posing as a woman seeking an abortion at 17 weeks gestation. 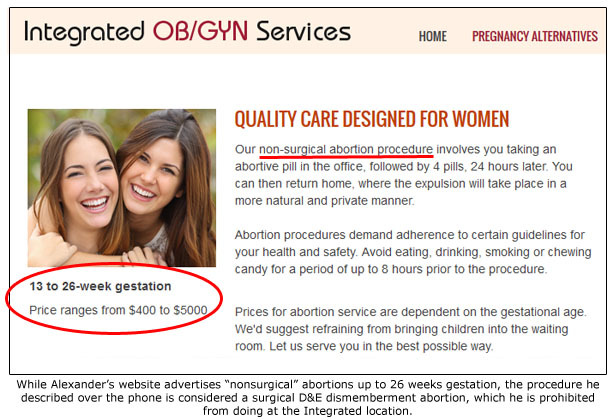 Alexander answered the call and explained that at 17 weeks the abortion would cost $900. He further described how the abortion procedure would be done. Alexander: Two day procedure. We would put medication into the uterus. That would be through the abdomen – needle through the abdomen. Then we put seaweed sticks in the cervix. Alexander: That will open up the cervix overnight, and we evacuate the pregnancy in the morning. The abortion process described by Alexander is known as a Dilation and Evacuation (D&E) procedure. The medication injected through the woman’s abdomen is digoxin, a drug that causes the baby to suffer a heart attack and die. The “evacuation” is usually accomplished by dismembering the baby and removing its parts from the womb. D&E abortions are considered surgical procedures. However, Alexander falsely advertises them as “medication” abortions that are available to 26 weeks gestation on his web site. Operation Rescue filed a complaint and requested that the Department of Health and Mental Hygiene shut down Alexander’s illegal abortion operation pending the outcome of revocation proceedings. This is not the first time Operation Rescue has caught Alexander on the wrong side of the law. Alexander had been subjected to license suspension in August 22, 2012, based in part on a complaint filed by Operation Rescue after a seven-month investigation into his association with disgraced Florida abortionist James Scott Pendergraft, IV. He and Pendergraft were operating an illegal late-term abortion business secretly out of Alexander’s Forestville abortion clinic. At the time, Pendergraft held no medical license in Maryland and was serving a license suspension in his home state of Florida. According to disciplinary records, Alexander was improperly prescribing drugs like Viagra to non-patients, engaging in “sexual boundary” violations, botched abortions, and shoddy or non-existent record keeping. In April 2013, just six months before inspectors would discover that Alexander’s abortion business was too dangerous to be licensed as an ambulatory surgical facility, Alexander’s medical license was restored and he was placed on a 2-year term of probation. Not long after, deficiencies discovered during the failed inspection caused Alexander to face further discipline for unprofessional conduct and probation violations in 2014. When asked to produce certain medical records, Alexander was evasive. Eventually he produced the records, but never adequately explained why they were not available in the first place. Later, Alexander blamed Operation Rescue for his disciplinary woes. Alexander’s penchant for dishonesty, shoddy practices, probation violations, and illegal behavior should have convinced the Board to revoke his medical license. Instead, Alexander was placed on probation for three years. Then in July 2015, Alexander was again caught conducting illegal late-term abortions. Disciplinary proceedings were once again initiated against him. During an interview in November, 2015, Alexander told Board investigators that he had not conducted an abortion, but had delivered a still-born baby in what he characterized as a “miscarriage.” Yet, among documents collected during the investigation were consent forms for abortion using digoxin to cause fetal demise. This case was pending when Operation Rescue again documented Alexander’s willingness in February to illegally conduct late-term Dilation and Evacuation procedures at his unlicensed facility in Forestville in violation of previous consent agreements and terms of his probation. “To ignore evidence of dangerous illegal late-term abortions represents, in my opinion, a dereliction of duty. We again call on the Maryland Board of Physicians protect the public and shut down Alexander’s abortion business and suspend his medical license on an emergency basis until the Board can work through the process to revoke his medical license,” said Newman. Please contact the Maryland Board of Physicians and demand that it immediately suspend Harold O. Alexander’s medical license and shut down his dangerous abortion business.